Foam coated process is to utilize the air to mix with the chemical into foam, which can reduce the moisture content, efficiently lessen the heat consumption and fasten the fabric drying speed. Meanwhile, because of the feature of low moisture content and slow penetration, the foam coated can be used for single-side coated and treatment, such as absorbent waterproof, PU film, and single side pigment coloring. Adopt SUS316 material with great corrosion resistance. Outer-hexagon tabular structure conducts large heat dissipating area. Four and six shear plane gear shape design defines into rotor and stator. The rotor speed is adjustable and can be controlled to uniformly mix the foam. The air volume adopts mass flow control to improve the accuracy of foaming. Foaming rate：The max. ratio design is 1：20，average usage is 1：3~10. 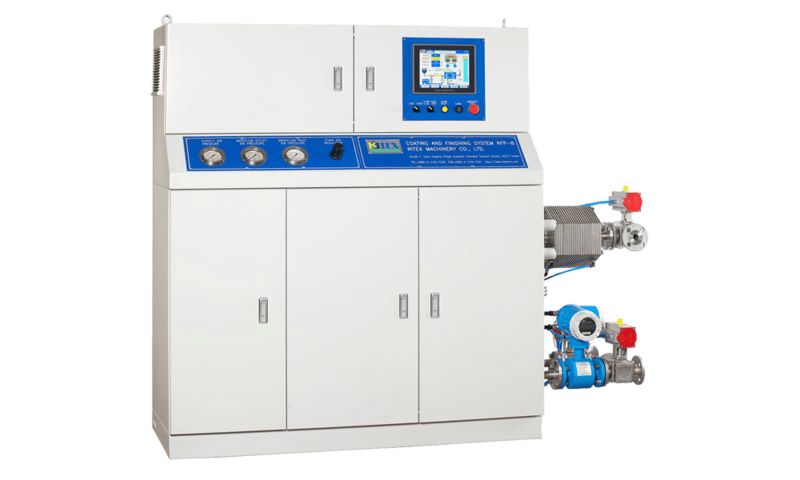 Adopt PLC+HMI control and recording system, can record the operating condition of foaming machine, such as foaming ratio, fluid flow volume and other operation mode. The foam making condition can be controlled and the data can be the basis of abnormal diagnosis. The control system of foaming machine and coating machine can be switched to reduce the work load. Recipe recording function to improve the quality and yield. Automatic Program-Logical-Control to operate the cleaning system. The extension of individual water cleaning pump can save time and human power, and also easy for operation. Almost no addictive of foam agent injects into the original liquid. After foam coating, the foam breaks rapidly and infiltrates into inside of the single side of fabrics. For example, non-woven resin carpet for vehicle, single side fireproof process, or absorbent waterproof process for knitting or woven fabric. Certain addictive of foam agent injects into the original liquid. The foam breaks and infiltrates into inside and surface of the fabrics before entering the drying oven. For example, cracking-yarn resistance process for woven fabric. Enough addictive of foam agent inject into the original liquid. The foam stays steadily on the surface of the fabrics and becomes a thick film by the high heat of drying oven. For example, blackout curtain coating, PU windproof coating.